Unfortunately, Réal’s wood white – as the new species (Leptidea reali (Reissinger, 1989) is called – has not been found in Britain, although it was found in Ireland in 2001, where it turns out to be commoner and far more widespread than its sister species (L. sinapis). (2) It also occurs in northern and NE Spain (it was discovered in the Pyrenees). 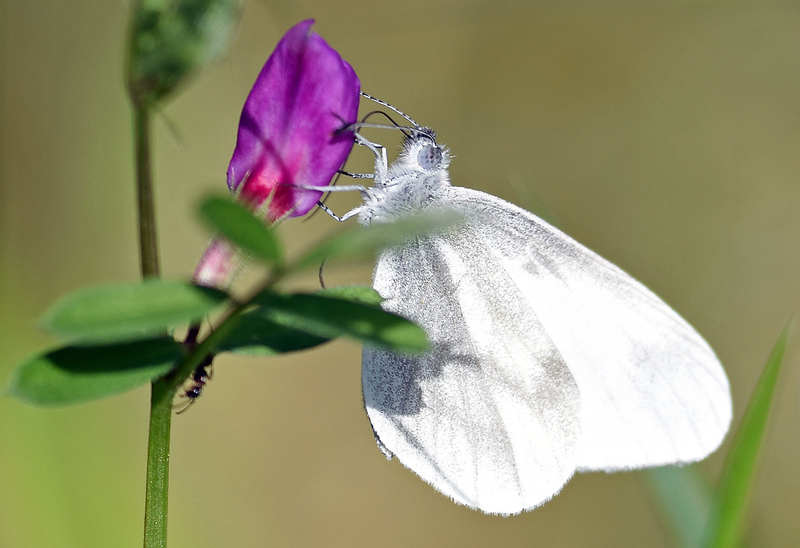 The photographs in this blog were all taken in NW Spain (Galicia); so it is possible that they feature Réal’s wood white, but since I did not capture and dissect them (! ), I will never know; which is OK by me. Réal’s Wood White has apparently been described as being a stronger flier and with a preference for more open habitats (2), which was certainly the case with the ones I photographed in Spain (below). Anyway, enough of this preamble, what concerns me in this blog is the behaviour of these attractive little butterflies. My fascination started when I captured some interesting behaviour in a lucky snap I took with a compact camera. I published the picture on my blog in 2014, although I was not sure what was going on (4). I should have guessed it was courtship behaviour. It turns out that quite a lot is known about these Wood Whites which have a characteristic courtship display where the male lands opposite the female and sways his head and waves his antennae backwards and forwards with his proboscis extended (5). I was fortunate to capture the proboscis being waved by the male (below). Charmingly, the male does not attempt to mate with the female until she has shown some sign of accepting his advances, which she does by lowering her abdomen so that it becomes visible between her wings. (6) She also bends her antennae backwards until they touch her wings (5). Perhaps emitting some sort of pheromone as well. I guess this all means ‘come and get me’! His behaviour has been called ‘non-insistent’ and her signal to him was called a ‘mating willingness’ signal (6). Isn’t science full of wonderful terminology! One way of telling the sexes apart in this species (rather these species) is via their antennae. The males have a large patch of white scales on the underside of the antennae, as shown in the illustration taken from Friberg et al. (2008). Fig. 2 from Friberg et al, 2007. Schematic picture of a male and female Leptidea antenna. (Illustration: Moa Lönn). Springer Press. 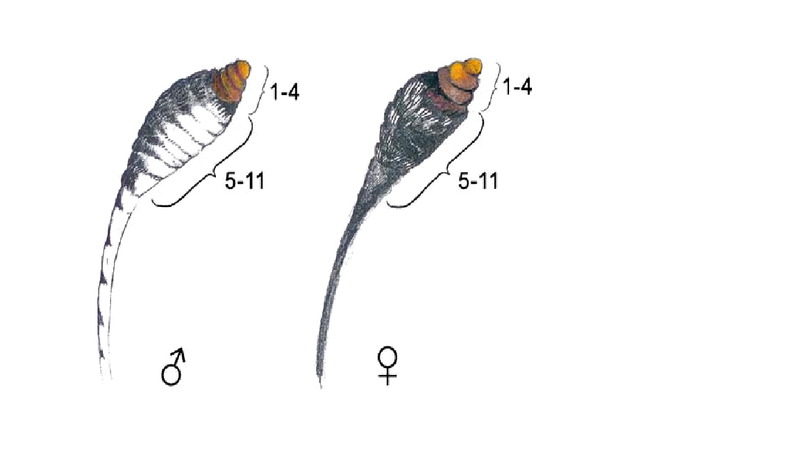 The difference in the antennae can also be made out in my snapshot (below) where I have highlighted the different lobes of the male and female (below). The males of both L. sinapsis and L. reali have a large patch of white scales on the underside of the antennae whilst females only have a few white scales in the midpart of the antenna. (7) Perhaps these white waving wands have the desired effect! 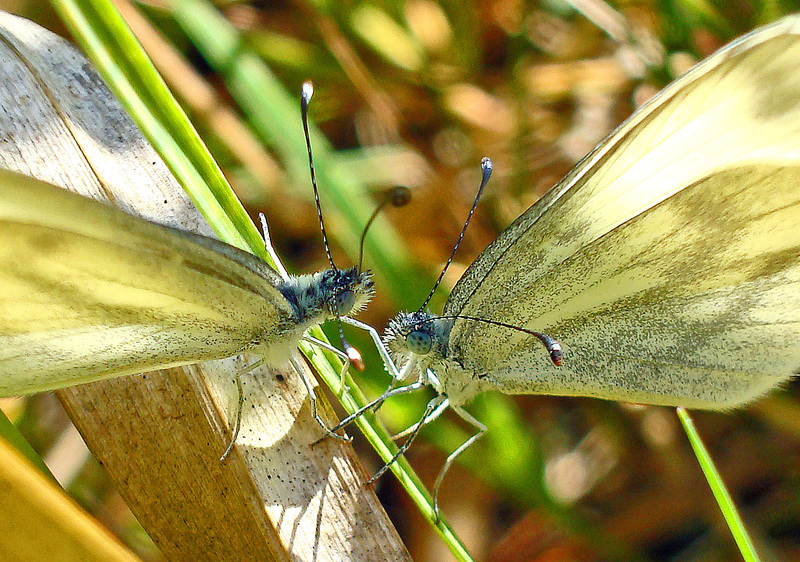 Wood white (Leptidea sinapis) butterflies courting; with antennal tips highlighted. Male on the left. Another fascinating detail is that some females waited for over 11 minutes of courtship behaviour by the male – that’s a lot of antennae and proboscis waving by the male! – before giving him the ‘come hither’ signal. Whilst other ladies were happy to give him the nod after only a few seconds! (6) Already mated females were courted for up to 35 minutes by eager males, without them giving any sort of signal; it’s hard not to anthropomorphise! The act of mating itself is quite long-lasting: between 25 and 55 minutes, before the male releases himself from the act of copulation and flies away (5). The situation is further complicated by the fact that the males do not seem to be able to determine which species they are courting. In other words, they don’t know if she is a L. sinapsis or a L. reali , which means that they can waste a lot of time and effort chatting up the wrong girl! (6). Rather unfairly, it seems that she can tell whether the male is of the same species as herself. All of this confusion is thought to be due to the fact that the species have only recently split apart. They have only had a quarter of a million years to get to know each other! Sachanowicz, K., Wower, A., & Buszko, J. (2011). Past and present distribution of the cryptic species Leptidea sinapis and L. reali (Lepidoptera: Pieridae) in Poland and its implications for the conservation of these butterflies. European Journal of Entomology, 108(2), 235. Dincă, V., Lukhtanov, V. A., Talavera, G., & Vila, R. (2011). 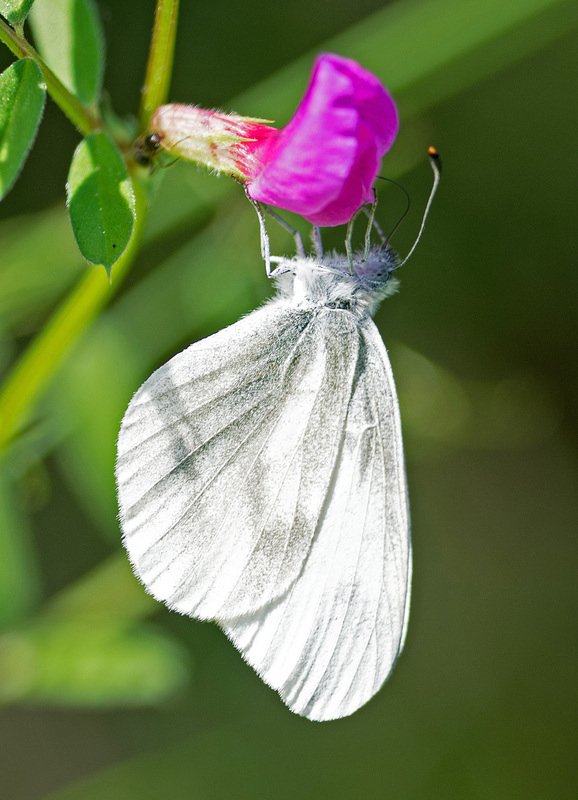 Unexpected layers of cryptic diversity in wood white Leptidea butterflies. Nature communications, 2, 324. Wiklund, C. (1977). Courtship behaviour in relation to female monogamy in Leptidea sinapis (Lepidoptera). Oikos 29, 275-283. Friberg, M., Vongvanich, N., Borg-Karlson, A. K., Kemp, D. J., Merilaita, S., & Wiklund, C. (2007). Female mate choice determines reproductive isolation between sympatric butterflies. Behavioral Ecology and Sociobiology, 62(6), 873-886. Friberg, M., Bergman, M., Kullberg, J., Wahlberg, N., & Wiklund, C. (2008). Niche separation in space and time between two sympatric sister species—a case of ecological pleiotropy. Evolutionary Ecology, 22(1), 1-18. Previous Previous post: What doesn’t kill you, doesn’t always make you stronger! If you are a bee. And we think of butterflies as such simple beings! Fascinating information and beautiful images of a species I’ve yet to see. Ray Cannon's nature notes Wood Whites go A-Courting!